Rain chains are an alternative to the rain water downspout traditionally found in standard rain gutter systems. Rain chains guide the rain water visibly down chains or cups from the rain gutter to the ground. Rain chains transform a plain rain water downspout into a beautiful water feature. Rain chains ('kusari doi' in Japanese) have been around for many hundreds of years. The Japanese have used rain chains to collect water from the roof of their homes. This water was guided into large barrels for household water usage. 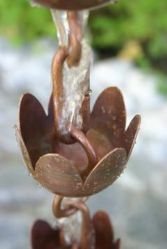 For this reason rain chains are a common feature in Japanese gardens and are a must for anybody creating a Japanese garden.